Estate find: This is an awesome vintage set! 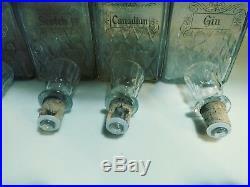 You get 5 vintage glass decanters that are etched in gold… They are: Bourbon Rye Gin Scotch Canadian All have original stoppers and corks. 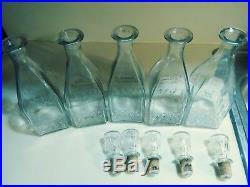 The decanters are damage free and in wonderful condition. 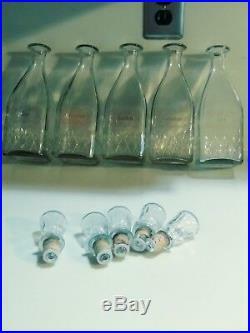 Stoppers remain fitted in each bottle nicely. 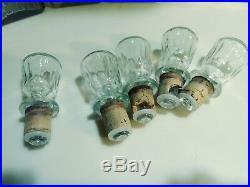 The corks in the Canadian and Bourbon decanters have pieces of cork missing and are not complete. 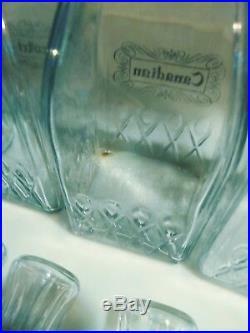 The cork in the Gin decanter is complete but has a visible crack and is fragile. The others seem to be okay. 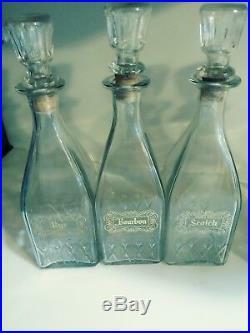 These decanters are very old. 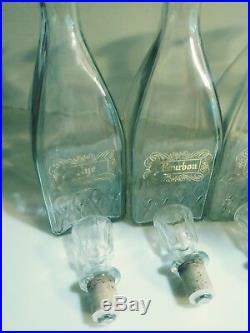 I will not guarantee the condition of the corks in any decanter. They are all old and dry and possibly fragile. 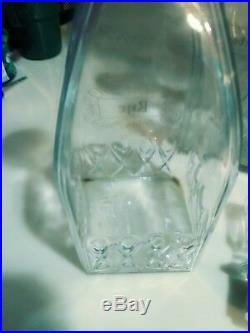 They measure approximately 11.75 in height from the bottom to the top of the stopper. 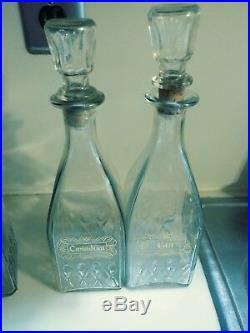 They had been stored in a bar area for decades and could use a cleaning. I did the best I could with the pictures. It was tough to see because of the glare. 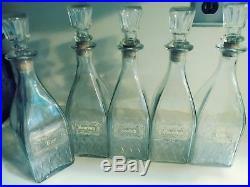 The item “Vintage Etched Glass Liquor Decanter Set (5) Scotch Rye Gin Bourbon Canadian” is in sale since Saturday, August 18, 2018. 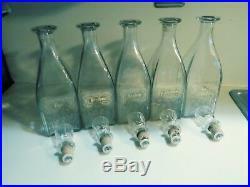 This item is in the category “Collectibles\Barware\Decanters\Pre-1970″. 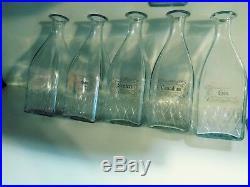 The seller is “xbrix052″ and is located in Aston, Pennsylvania. This item can be shipped to United States, Canada, United Kingdom, Denmark, Romania, Slovakia, Bulgaria, Czech republic, Finland, Hungary, Latvia, Lithuania, Malta, Estonia, Australia, Greece, Portugal, Cyprus, Slovenia, Japan, China, Sweden, South Korea, Indonesia, Taiwan, Thailand, Belgium, France, Hong Kong, Ireland, Netherlands, Poland, Spain, Italy, Germany, Austria, Bahamas, Israel, Mexico, New Zealand, Philippines, Singapore, Switzerland, Norway, Saudi arabia, Ukraine, United arab emirates, Qatar, Kuwait, Bahrain, Croatia, Malaysia, Chile, Colombia, Costa rica, Dominican republic, Panama, Trinidad and tobago, Guatemala, El salvador, Honduras, Jamaica, Antigua and barbuda, Aruba, Belize, Dominica, Grenada, Saint kitts and nevis, Saint lucia, Montserrat, Turks and caicos islands, Barbados, Bangladesh, Bermuda, Brunei darussalam, Bolivia, Egypt, French guiana, Guernsey, Gibraltar, Guadeloupe, Iceland, Jersey, Jordan, Cambodia, Cayman islands, Liechtenstein, Sri lanka, Luxembourg, Monaco, Macao, Martinique, Maldives, Nicaragua, Oman, Pakistan, Paraguay, Reunion, Uruguay.